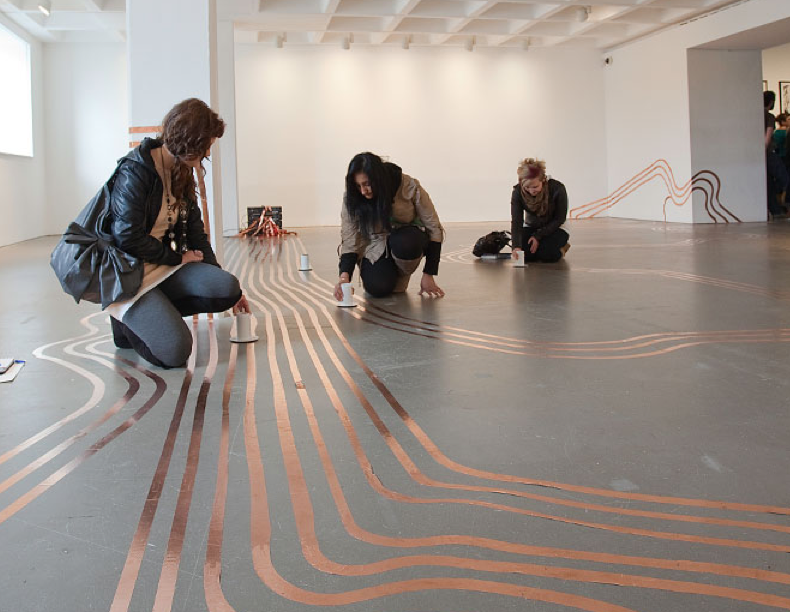 A silent labyrinth created out of open copper trails on the floor carries the electrical signals of a multichannel sound repository. By putting wireless speaker-cylinders on them, the carried soundlayers become audible and the interpretation by the visitors is made possible. The “Offene Schaltkreis” reacts depending on the way how the speakers are used: if nothing is moved, the sounds stay calm and soft, but as soon as a single cylinder is placed elsewhere, the sounds of all speakers intensify simultaneously. This results in a dynamic relation between silence and noise, which is influenced by the visitors. Christoph Haag was born in 1981 in Kempten, Germany. He studied art history and philosopy in Augsburg. In 2007 he graduated in Audiovisual Media at the Academy of Media Arts Cologne. Since then, he works as a freelance designer, typographer and publisher. Martin Rumori was born in 1976 in Berlin, Germany. He studied musicology, computer science and philosophy in Berlin and received his M.A. in 2005. Besides his freelance work, he is a research project assistant at the Institute of Electronic Music and Acoustics Graz, Austria. Franziska Windisch was born in 1983 in Memmingen, Germany. She studied fine arts at the Academy of Media Arts Cologne, Bezalel Academy of Arts and Design Jerusalem, Israel, and Städelschule Frankfurt/Main, Germany. In 2010 she graduated in Audiovisual Media at the Academy of Media Arts Cologne. Ludwig Zeller was born in 1981 in Sonthofen, Germany. In 2008 he graduated in Audiovisual Media at the Academy of Media Arts Cologne. He is currently finishing his M.A. at the Royal College of Arts in London, United Kingdom.